L.I.F.T. Facial Acupuncture- Remee Gemo creator of the L.I.F.T. Facial Technique has been doing facial acupuncture for over a decade. She has had extensive experience and education in a variety of different styles of cosmetic acupuncture and specialized needling techniques as a precursor to creating her own anti-aging procedure. L.I.F.T. is superior to other systems of facial rejuvenation in that it address the individual aspects and of each person's face and formulates a unique protocol dependent on that person's anti-aging goals, level of health and emotional state utilizing precise needling method and Chinese facial analysis. Chinese facial analysis is particularly useful when stress or emotional trauma has rendered a sudden aging of the face. L.I.F.T. Facial Acupuncture can lessen the severity, depth, length and even eradicate wrinkles in all parts of the face. The larger lines such as the nasolabial groove or "parenthesis" can be rejuvenated to be less deep, lines around the lips respond very well to acupuncture and crow's feet shorten and are less noticeable also lines across the forehead can be softened. In areas that sag such as the jawline, jowls, brow, upper lid, cheeks, and brow L.I.F.T. Facial Acupuncture can lift these areas to to give a more firm, tighter and clean line. Due to the fact that L.I.F.T. Facial Acupuncture also treats the body from a wholistic perspective the complexion and systemic/hormonal problems can also be addressed. The improved blood circulation and enhanced general health addresses issues like rosacea, acne, rashes and some discolorations. The overall texture of the skin is made more supple and elasticity is improved due to the increase in collagen and elastin created. Left is before and Right is after-note the improvement in wrinkles of the forehead, bridge of nose, under eyes, nose to lip groove, and jawline. Results after complete series. 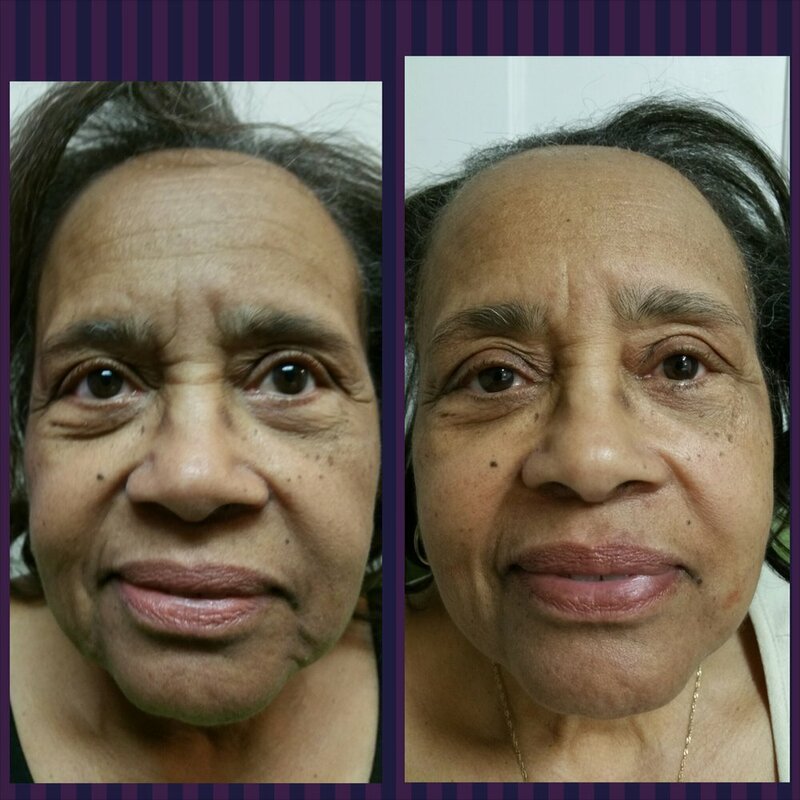 Before Picture, note wrinkles (especially at eye, lip line, mouth corners, sagging and complexion. After Picture -note eye, mouth, lip and jawline. Left is before and right is after. Notice there is less sagging around the mouth and along the jawline. Results after complete series. After the initial series of 12 visits the results last for 3-5 years with seasonal maintenance (4 maintenance visits a year every 4 months).